Reprint. Originally published: London: Bloomsbury Circus, 2017. A powerful exploration of the clash between society, family and faith in the modern world' GuardianIsma is free. After years spent raising her twin siblings in the wake of their mother's death, she is finally studying in America, resuming a dream long deferred. But she can't stop worrying about Aneeka, her beautiful, headstrong sister back in London - or their brother, Parvaiz, who's disappeared in pursuit of his own dream: to prove himself to the dark legacy of the jihadist father he never knew. Then Eamonn enters the sisters' lives. Handsome and privileged, he inhabits a London worlds away from theirs. As the son of a powerful British Muslim politician, Eamonn has his own birthright to live up to - or defy. Is he to be a chance at love? The means of Parvaiz's salvation? 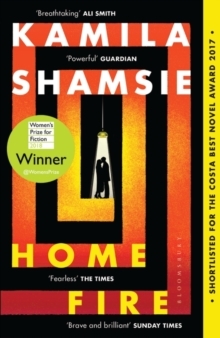 Two families' fates are inextricably, devastatingly entwined in this searing novel that asks: what sacrifices will we make in the name of love?A contemporary reimagining of Sophocles' Antigone, Home Fire is an urgent, fiercely compelling story of loyalties torn apart when love and politics collide - confirming Kamila Shamsie as a master storyteller of our times.